This is an optional section of the system but can be used effectively to assist with tracking payments received from candidates for examinations to be taken. To use this facility the examination details for all candidates taking an examination should be entered well in advance of the actual session. 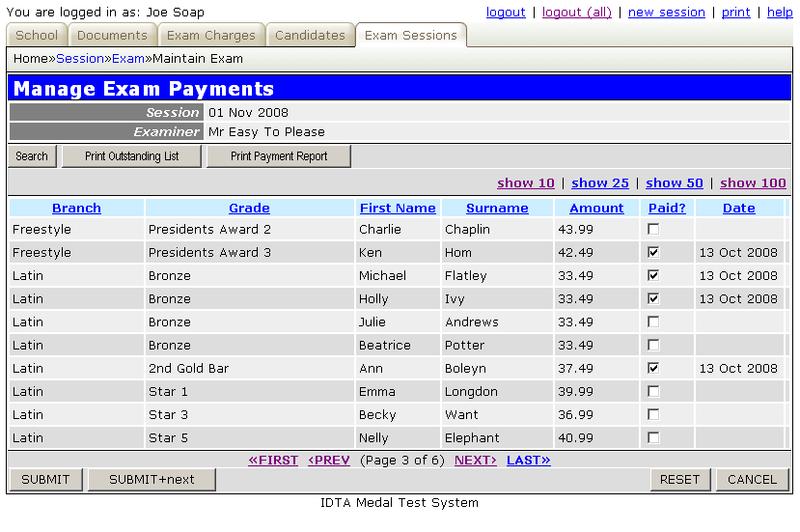 The payments screen is reached from the Main Exam Details Screen by clicking on the "Manage Payments" button. On first entry to this screen all of the candidates examinations will show as unpaid. The examination fees are retrieved from the Exam Charges Screen based upon the date of the examination session. To mark a fee as paid, simply place a tick on the appropriate candidate examination row(s) and click "SUBMIT". The system will automatically display the date on which the payment was recorded in the system. Print Outstanding List This option will print a report of ALL outstanding payments, in Surname order. The report will include a blank column so that the report can be used as a manual record for receiving payments from candidates. The system can then be updated later to record which examination fees have been paid, and a fresh Outstanding Payments Report can then be produced. Print Payment Report This option will print a report of all payments that have been received. The report is grouped by payment date to provide control totals for each day in order to simplify tracking of payments received.